Growing up, I had horrible acne. I mean tragic, awful, completely terrible skin. I wouldn't leave my house, I looked like a monster without makeup but wearing makeup made it worse, and looking in mirrors and photos made me want to cry. I wouldn't even make eye contact with people because I thought maybe they wouldn't notice. Seriously. I would be having a conversation and looking at the person's shoes... LOL. Today isn't too detailed but if you ever want to hear about how I cleared my skin I will definitely do that in the future! Dealing with acne prone skin, I've tried basically every solution out there from cleansers and serums to creams and masques. Keep reading for all the deets on some of my favorite, drugstore fixes- and for under $15! This baby is definitely worth the hype. The charcoal helps to remove impurities while detoxify your skin for a radiant glow. It goes on super smooth and dries quickly- without drying the skin- so you don't have to have a sticky mess on your face. Rinse off after 10 minutes and you'll be greeted by glowing skin. Did I mention it's only $10??? Yep, that's right, it's $9.79 and you can pick it up at your local Target. You're welcome. Ok, this is addictive. I've always been that weird person who like's peeling sunburns...... so peeling a mask off your face in one go is fun as heck. The citrus and papaya work together to brighten dull skin and it smells amazing! Relax for a few minutes and then peel away all those clogged pores and dead skin cells. Hello radiance. Get your glow on for $6.99 at target! As if you needed another reason to love Lush. Not only are their bath bombs God's greatest gift to man, but their skincare selection is out of this world. Don't Look at Me is fun, it's neon blue, it smells like lemon, and works wonders for your skin. It gently exfoliates while moisturizing in the process. I take this with me on vacations and keep it in the hotel fridge for a cooling effect. 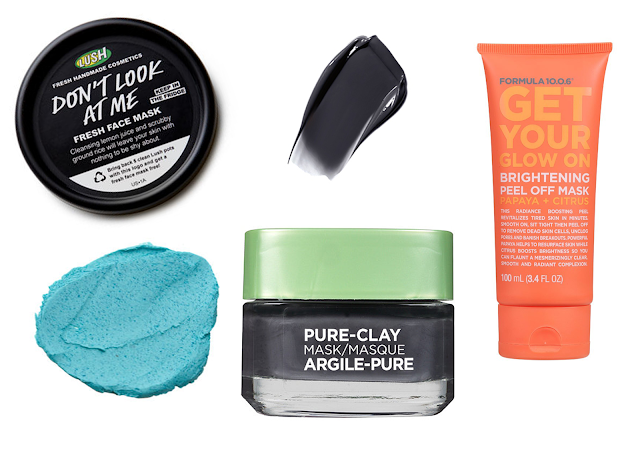 Dry summer skin and sunburns are no match for the cold, soothing powers of this blue goo. Stop in at Lush and find this for $12.95! haha! so glad I'm not the only one who peels my sunburns... lol!! its super weird hahaha no shame tho!